Skin problems affect everyone at some point in life, and if you have sensitive skin, prone to acne, you have surely already tried every single product on the market. Yet, most of these products are full of harsh chemicals that damage the skin and strip it of its natural moisture. The root cause of acne is still unknown, but among the many, we should list hormonal changes during puberty. Yet, not many know that acne can also be a result of an infection in the openings of sebum glands, as they can get clogged by bacteria. This causes pain, swellings, redness, and inflammation. Today, we decided to share with you the best natural skin remedy-- coconut oil! This natural oil is a powerful and versatile beauty product, that can do wonders for your skin health, due to the strong moisturizing, antibacterial, and antifungal properties! Coconuts consist of milk, meat, juice, and oil, and as soon as they are harvested from the coconut palm tree, the oil is extracted from the meat. It is largely made up of saturated fats and is rich in medium chain fatty acids, such as lauric and capric acids, which protect the skin. This oil is high in vitamin E, that clears blockages of the sebum glands, which is often the actual cause of acne. Moreover, its powerful anti-inflammatory qualities soothe inflammation. 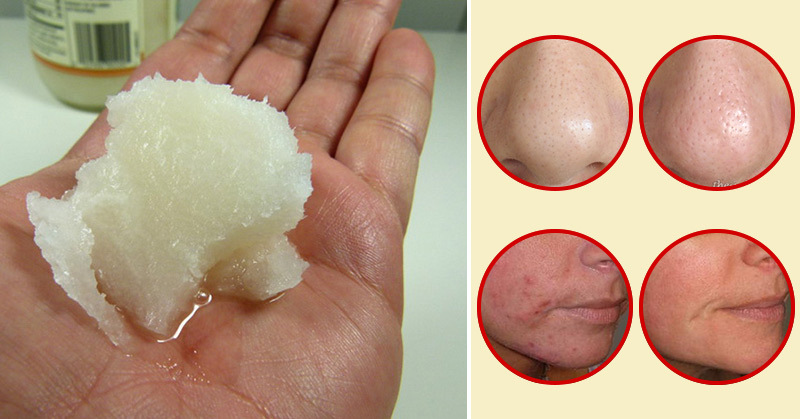 “Coconut oil is wonderful as a face cleanser, moisturizer, and sunscreen, but also it can treat many skin disorders. The fatty acids (caprylic and lauric) in coconut oil reduce inflammation internally and externally and moisturize, making them a great solution for all types of skin conditions. If you combine this oil with some other essential oil, like tree or lavender oil you will get a potent natural acne cure. Tea tree oil contains terpinen-4-ol, which provides strong antimicrobial, and antiseptic qualities, and lavender oil is excellent for sensitive and damaged skin. Lavender oil will also relax you and relieve stress, which is often the reason for acne breakouts. Melt the coconut oil in a saucepan, over low heat, and take it off the stove. Add 5-6 drops of some essential oil, preferably lavender or tea tree oil. Mix well, and pour the remedy in a mason jar. Leave it to cool and then rub it on the face with gentle movements. Rinse with lukewarm water. Repeat twice daily, in the morning, and in the afternoon. Store this acne remedy in a cool, dry place. This will eliminate the dead skin cells, promote the natural moisture of the skin, treat acne, and control the production of oil. Additionally, the beneficial properties of coconut oil will naturally reduce the appearance of wrinkles, and tighten the saggy skin. Your skin will be healthy and young-looking again soon!